It's NOT all about GOrillas you know! I've been working on a whole bunch of things this fall and I'd like to show you some of them now. 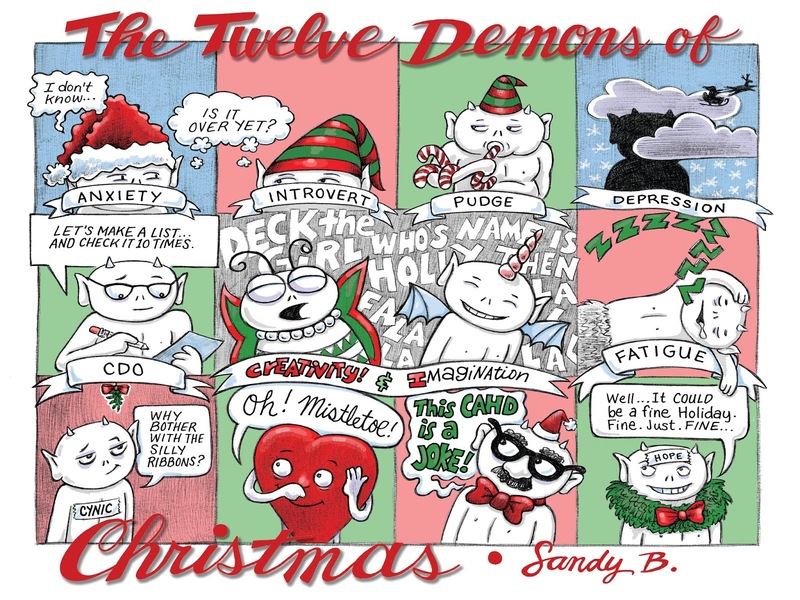 The Demons from We Will Never Leave You have been up to all kinds of things besides my Christmas Card. I've started thinking of ideas for a sequel as well. I made a tiny "zine" of the Demons and I'm looking into making a tiny Teachables class with it. I'm planning out Demons Trading Cards. 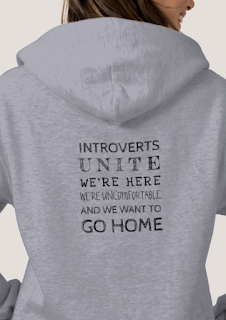 It's very soft and cozy - perfect for hiding out. 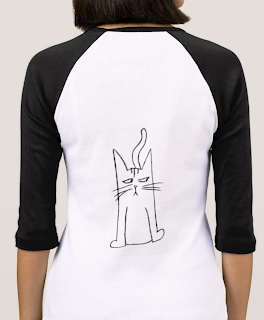 I got an XL so I could disappear completely (they're available up to 3X). 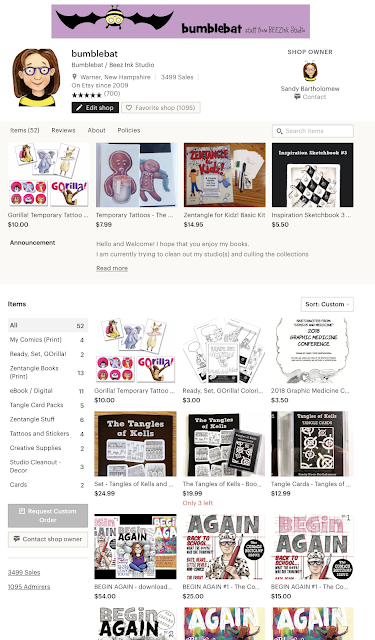 They sell for $50, but Zazzle often has excellent coupons that make it a no-brainer. If she doesn't want to be that specific about WHY we should go away, she can cross her arms across her chest, like a teenager. Just, "Go Away." Maybe you remember my daily comic collection, QUO VADIS? (That means "Where are you going?") I created that comic as part of my Thesis - I drew a cartoon or sketch every day for a year. But the published edition (which sold out!) 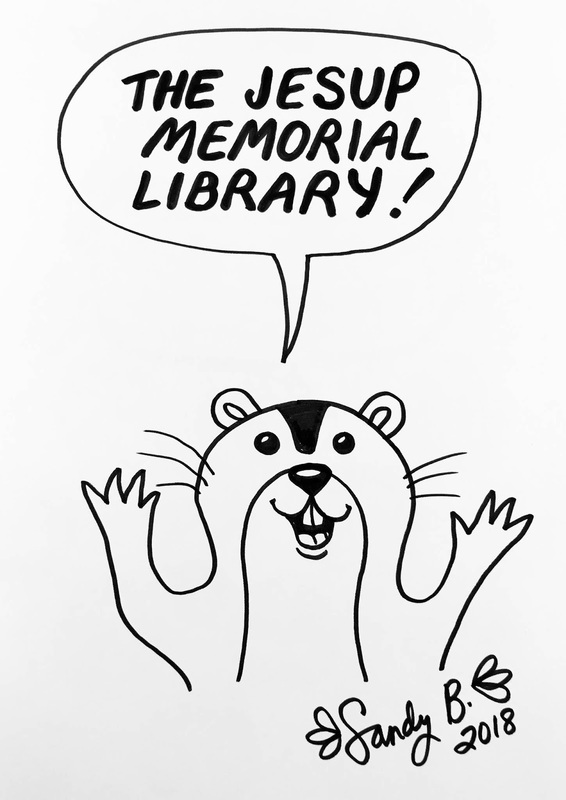 only included 7 months, since I had to publish what I had drawn so far for the thesis committee. BUT - I kept drawing cartoons every day until the end of July - one complete year! 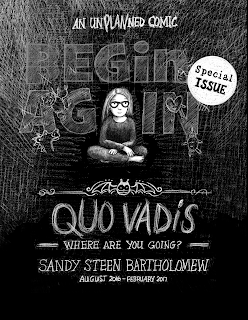 I'm working on revising and republishing QUO VADIS to include the entire year. I will probably do a Kickstarter to presell the comics. Stay tuned! 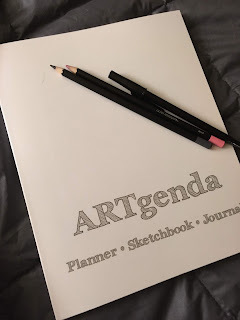 But the partner project to QUO VADIS is the ARTgenda - which is a "Planner - Sketchbook - Journal." 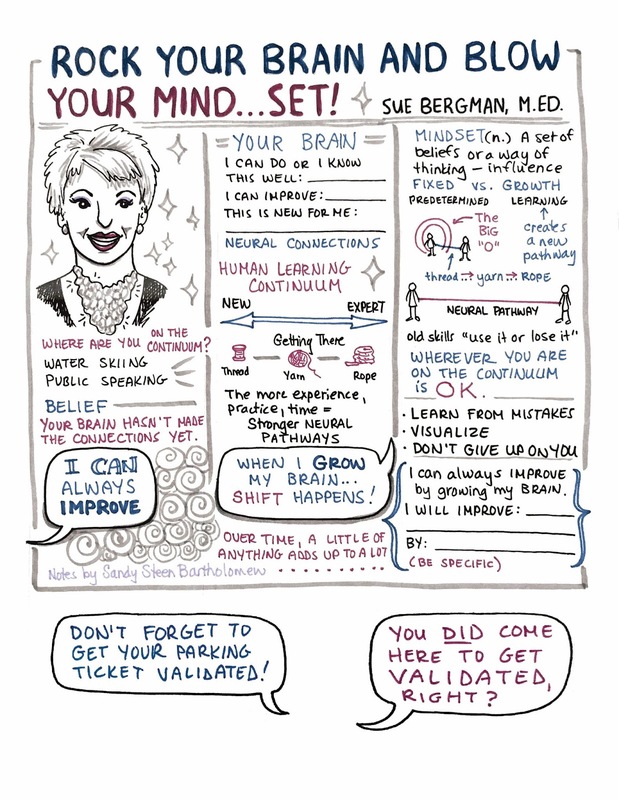 The calendar comics are so-called since I drew them in a weekly formatted calendar. It worked well in that it kept me moving - don't miss a day! - but there were a number of things I did not like about it. 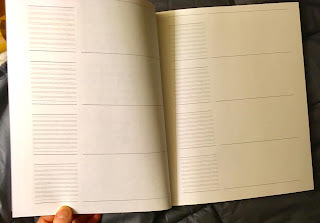 The paper was really thin, Saturday and Sunday were smaller boxes, I had to start on the date the calendar started, etc. So, just in time for the New Year... I redesigned it all and created my own... the ARTgenda. 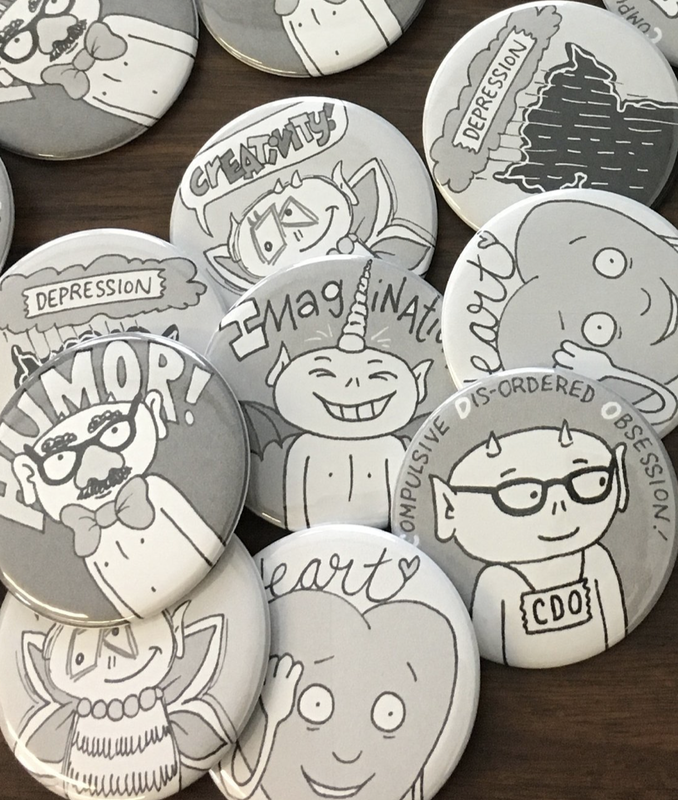 I printed them through BLURB (an on-demand printing company) and they look and feel really nice! 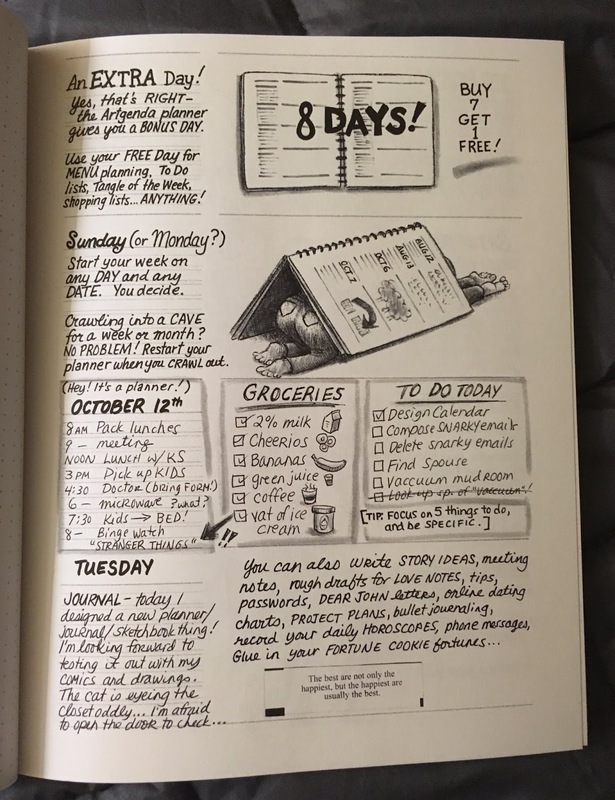 "The perfect planner, sketchbook, and journal for creative people. Can be used as a weekly calendar too. 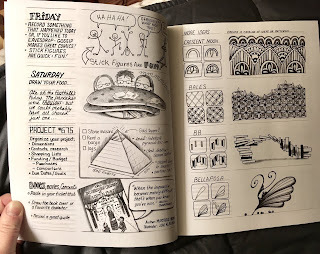 Perfect for doing a "drawing a day" challenges or keeping track of books read, Zentangle® patterns- anything! 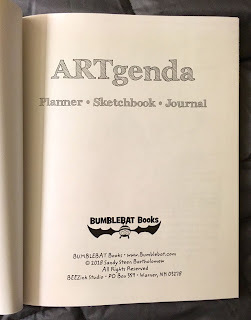 Features 4 intro pages with ideas and suggestions for use. 52 undated, weekly spreads - with 8 days each. Weekends are just as important as Weekdays!" 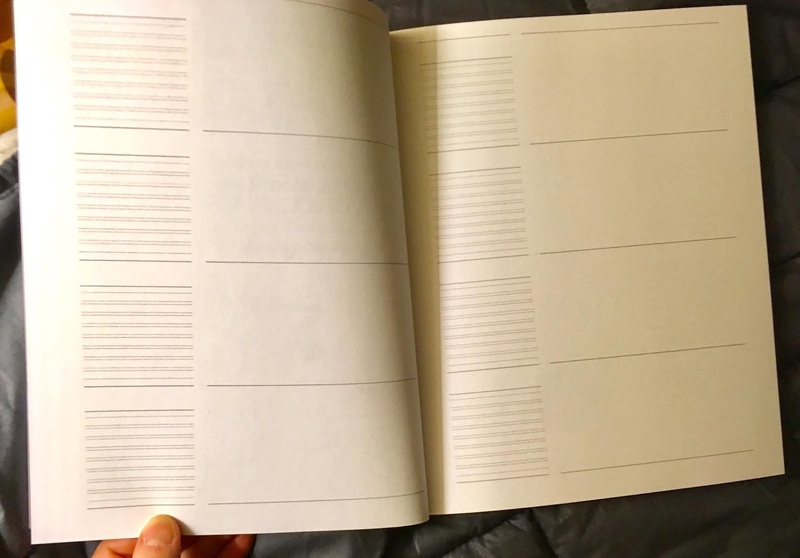 It has 120 - 8"x10"pages. You can order them directly from BLURB - especially good if you want to get a quantity discount or use a BLURB promo code, or if you live outside the US. If you are in the US, you can also order them (not with a discount) from my Etsy store, Bumblebat. Lastly - if you'd like to see (most of) the calendar comics I drew, you can see them on my Patreon page. I hope you find some Joy and Peace amidst the chaos. 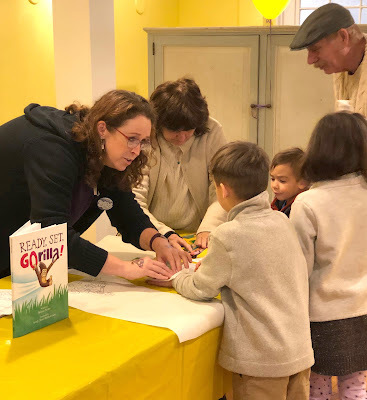 My Interview on Melissa Stoller's Blog! Take a look at my interview! Click HERE to go to Melissa's Blog. 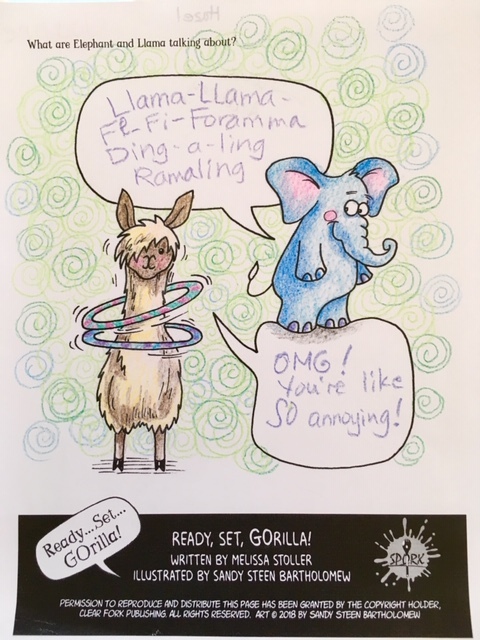 I got the coolest gift from Melissa Stoller - the author of Ready, Set, GOrilla! 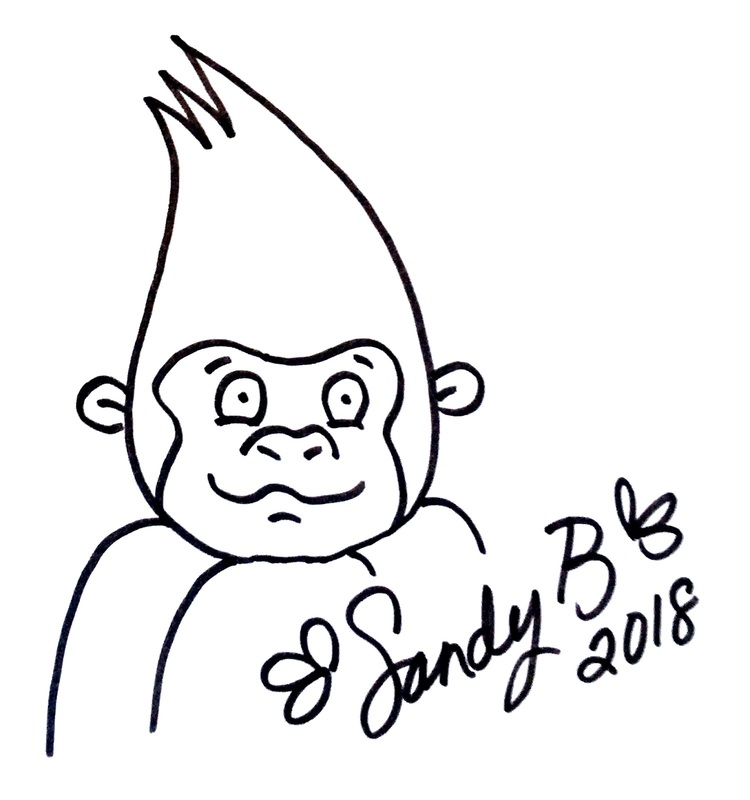 Melissa had adopted a (real) gorilla in my name! I had been concerned at first - where would he live? My house is bursting at the seams with extra people and dogs. And then, what happens if GOrilla challenges the dogs to a race? Would he revert to his old ways and... GASP ... CHEAT? ... it makes him look much larger than he really is. Oh, wait - maybe he's more competitive than I realized!? Nah. Mostly he's very silly. And incredibly soft. And gives very nice hugs. Is that the coolest present ever? THANKS MELISSA!! I'm having a Studio Sale this weekend in my Etsy​ shop! Use the code: HOLIDAY18 to get 15% off your purchase. I'm trying to clear some space for the new projects I'm working on! This sale runs from Dec. 14th-16th and I will try to send your packages out ASAP, but I can't guarantee delivery before Christmas. Only Santa can make those kinds of promises! 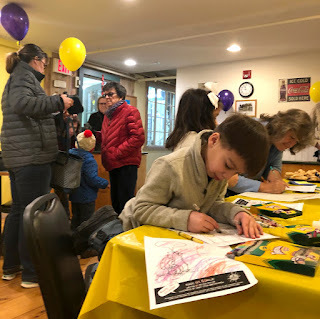 We did a craft fair this past weekend and kept ourselves busy... coloring! 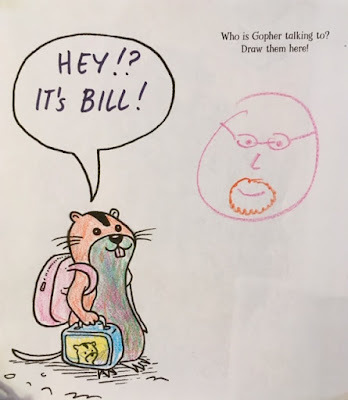 But it also reminded me that I needed to add the coloring pages to my web site. So I did. 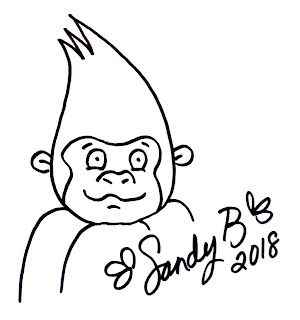 If you'd like to pay me for the coloring sheets, click HERE. If you want them for FREE, click HERE. I still have lots of tattoos on my Etsy shop too! 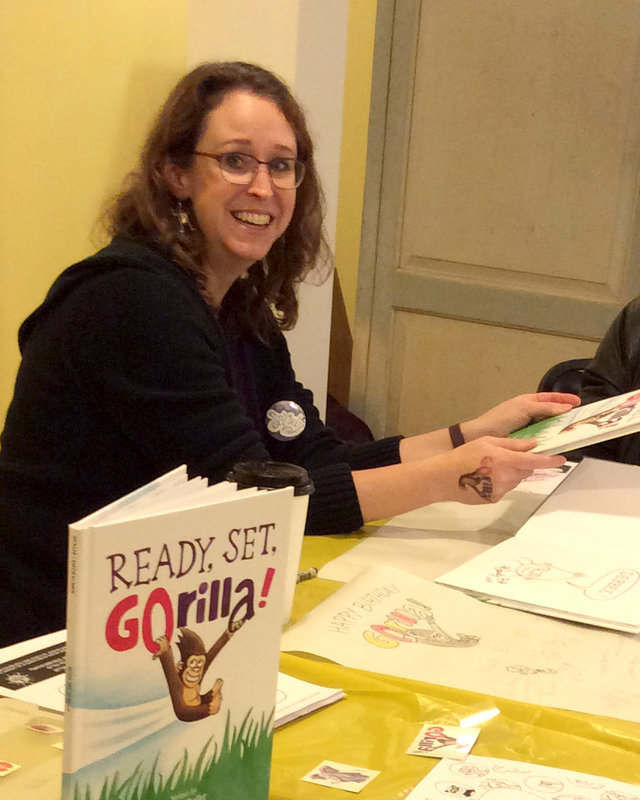 We had a great Book Birthday on Saturday for Ready, Set, Gorilla! We took over most of the Velvet Moose Ice Cream shop in downtown Warner, NH and applied a LOT of tattoos... 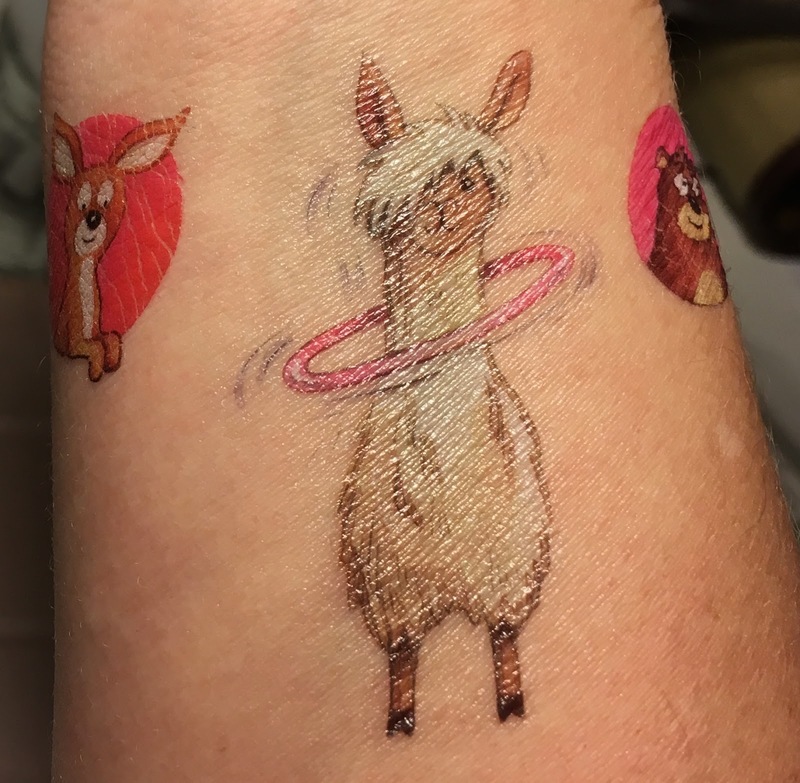 I lost count of how many times I said, "Now press this wet paper towel onto the tattoo and count to 30, OK? OK? Um... 1...2...3...4... ..."
Gopher was the most popular tattoo and also fit nicely on many of the tiny hands. 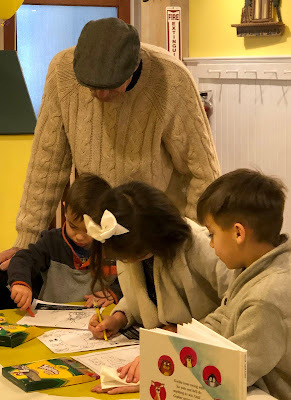 Coloring sheets were also a favorite activity. We put the "shopping" area on the other side of the room so there was no confusion. 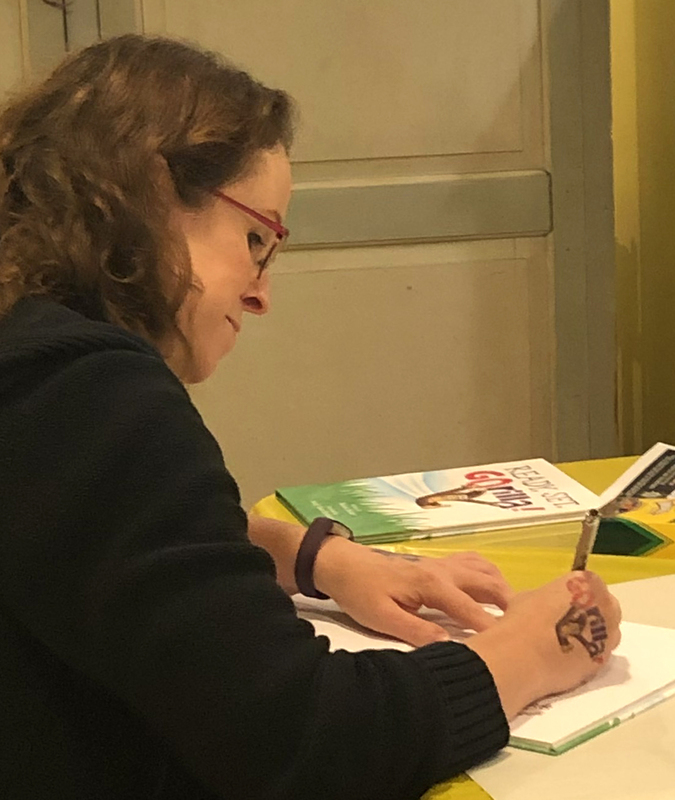 I signed and customized a bunch of books. I got to hang out with a bunch of my favorite Big People too! And there were yummy snacks! 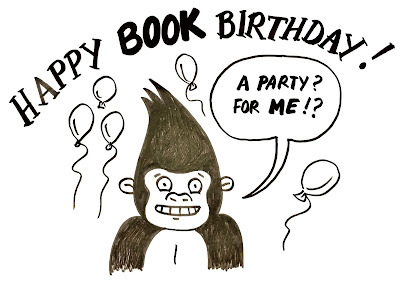 And we made a "Book Birthday" Card for GOrilla! And then we stumbled out into the town-wide holiday festival... exhausted, but happy. 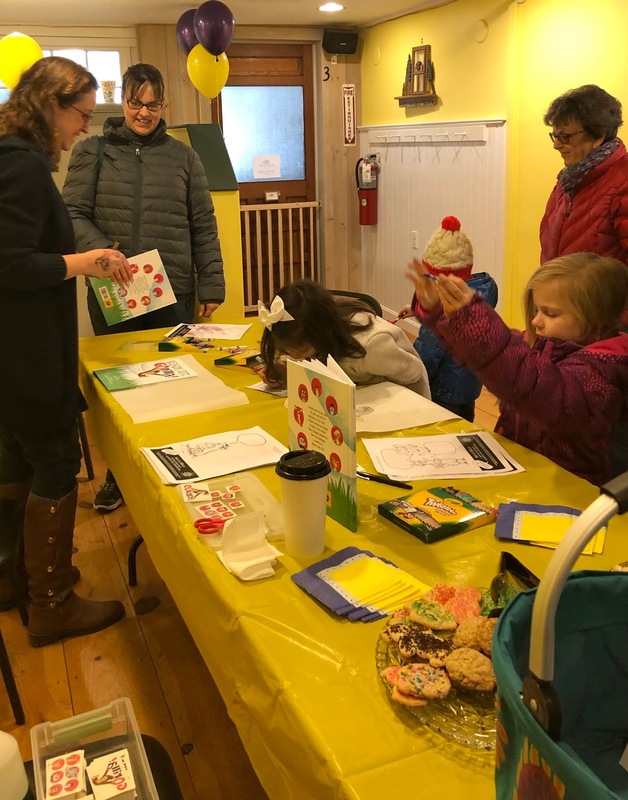 NOTE: If you weren't able to make it this weekend, we'll also be set up at the PLAYGROUND POP-UP SHOP at the Simonds Elementary School in Warner, NH. The holiday shopping event will be on December 8th, from 10am-2pm. 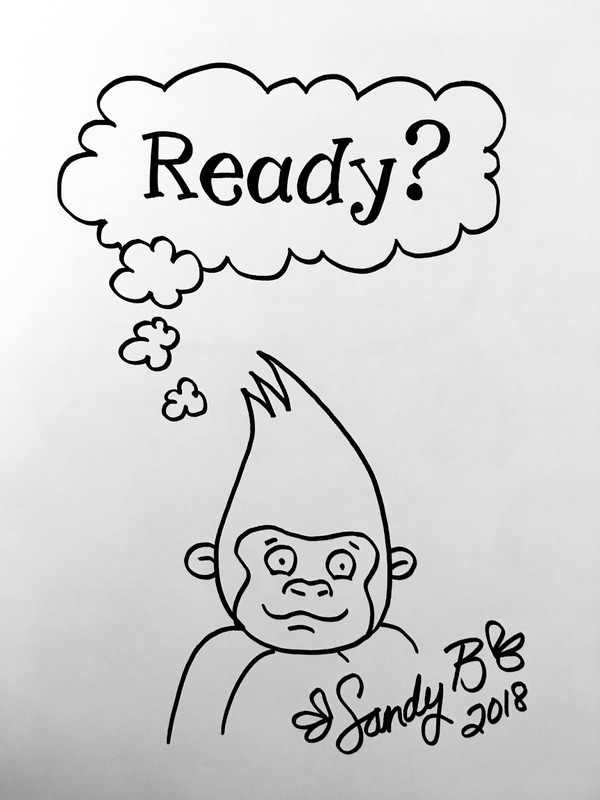 Ready, Set, Gorilla! 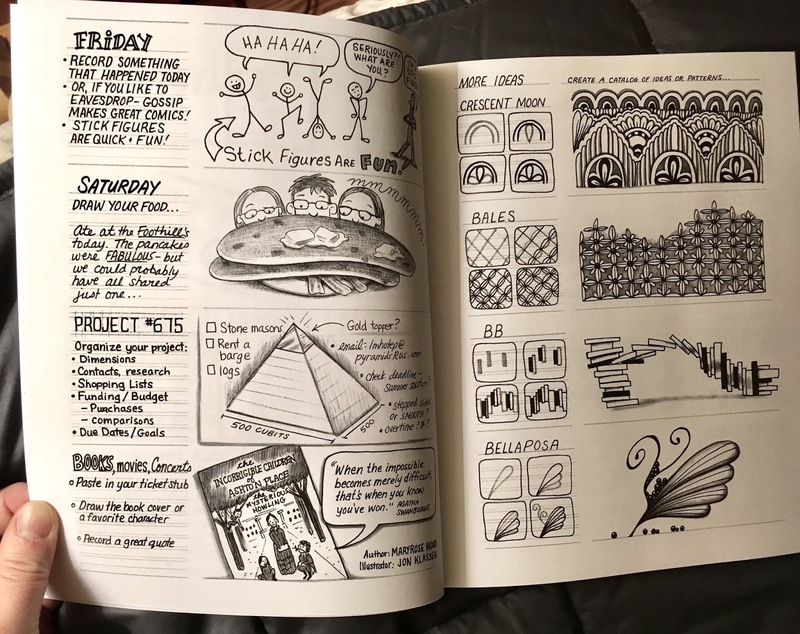 - the book and tattoos - will be available as well as Zentangle trading card packs, and We Will Never Leave You (my Demons) comics and buttons too. 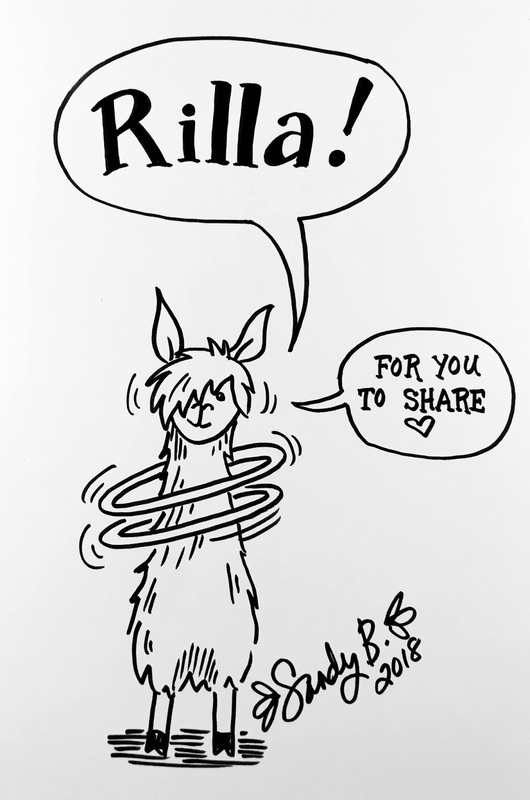 And one last thing - if you've seen the book and can think of something positive to say about it... PLEASE leave a review on Amazon. Thanks! 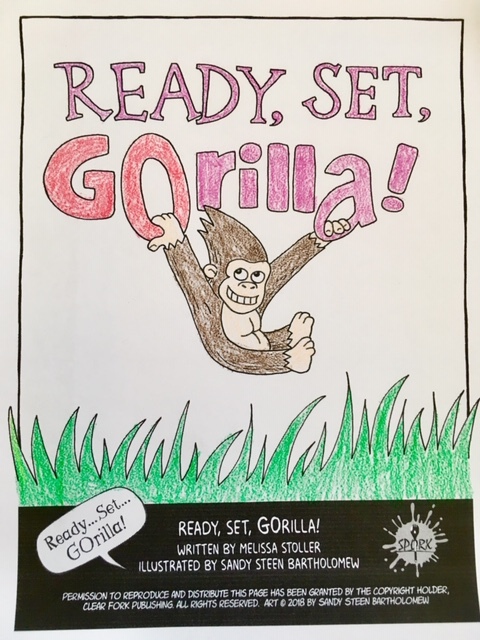 I got a stack of Ready, Set, GOrilla! books just in time for the Book Birthday Party this Saturday at the Velvet Moose in Warner. I hope that you will join us! The party is from 11am til Noon and is part of the Warner Hometown Holidays Celebration. There is a lot going on around town so spend the day! 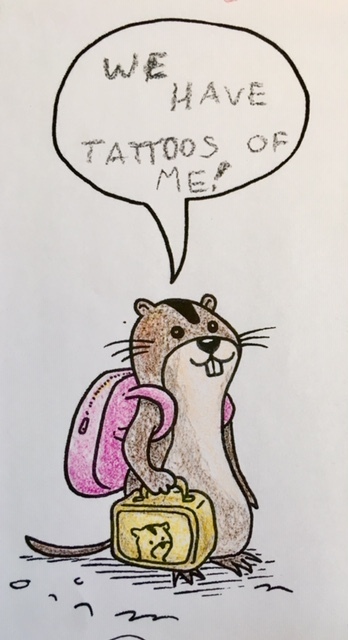 We will have coloring sheets, tattoos, and snacks, so bring your kids. We'll also have a limited number of signed/sketched books and lots of tattoos and pins for sale - great holiday gifts and stocking stuffers! I'm proud of it and want you to be proud too!" Amazon is saying the books take about a month to ship...?! And if you want the book signed, or signed and with a sketch, and with TATTOOS! You can order it from me at my Etsy store, BUMBLEBAT. 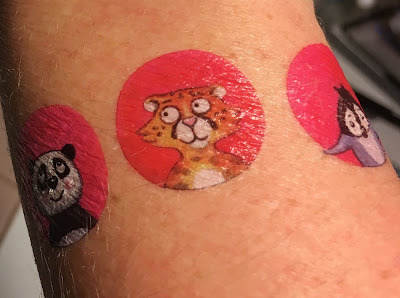 If you get the book from a bookstore and want some free tattoos... send me a SASE (that means an envelope with your address and postage stamps!) and I'll mail you back some Tatts. 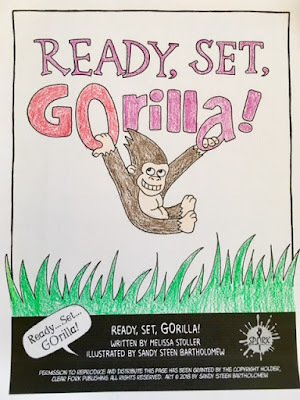 Happy BOOK Birthday, "Ready, Set, GOrilla!" Today is THE day! 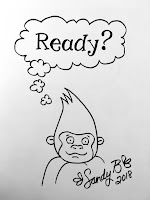 The BIRTH of Ready, Set, GOrilla! written by Melissa Stoller, illustrated by (ME!) 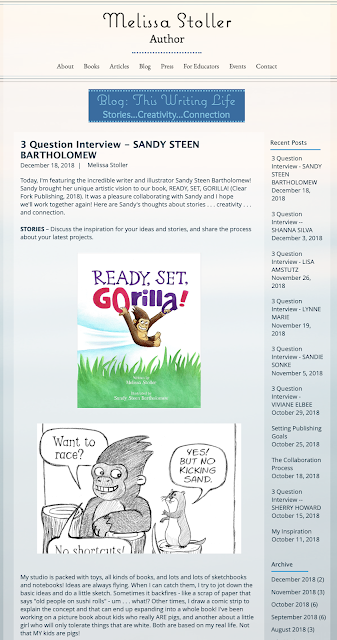 Sandy Steen Bartholomew, and published by Spork/Clear Fork Publishing. I am SO excited, but I don't know what to do with my energy - just wandering around the Studio thinking how hungry I am and I need a Book Party and cake... maybe some balloons? Melissa and I celebrated with Callie, our publisher, on Facebook Live - watch our video! And we have already started to come up with more ideas for the characters and we need STUFFIES! Which characters would you want as stuffed animals? Yes - I'm all over the place. Sorry. We'll be having a little Book Party celebration on December 1st, from 11am-Noon, at the Velvet Moose in Warner, NH. Kids are welcome - there will be coloring pages, tattoos, snacks. But I'd also LOVE to see you big people too. This is my way of celebrating a success (Hey! I have a new published book!) so please come and celebrate with me. If you can't make it to the party, the books will also be available at the Pop-Up Holiday Shop on December 8th at the Simonds Elementary School (also in Warner, NH). And you can order the book on Amazon and from other booksellers. 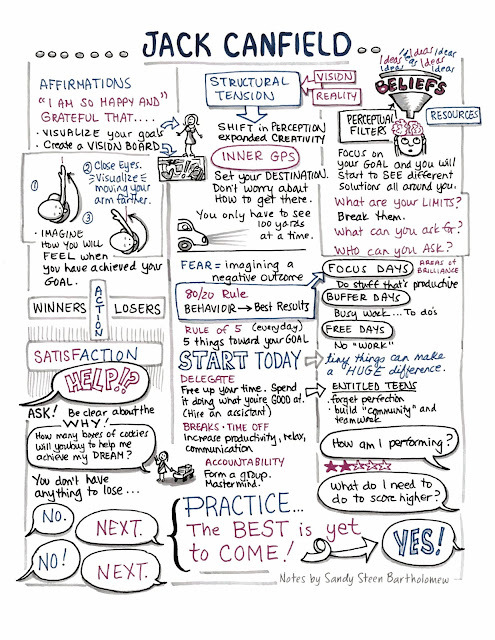 Yesterday was an AMAZING Conference for Women in Manchester, NH, sponsored by Women Inspiring Women. 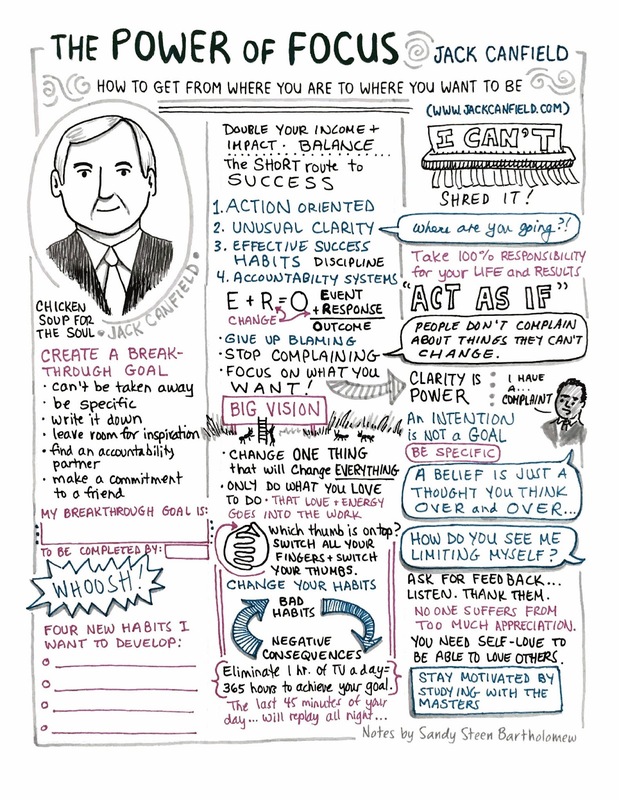 The speakers were Jack Canfield, Cristy "Code Red" Nickel, and Sue Bergman. Take a look at my sketch-notes below and then going the Women Inspiring Women group!! I have stacks and stacks of tattoos on my drafting table! Now I'm just waiting to get the books from the publisher. They are a little bit shiny when you first apply them. Friday (today!) 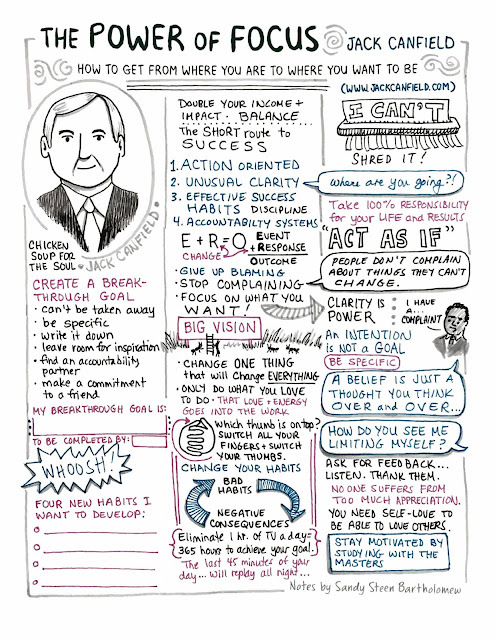 I'll be sketch-noting the NH Women's Conference (Jack Canfield!!!) 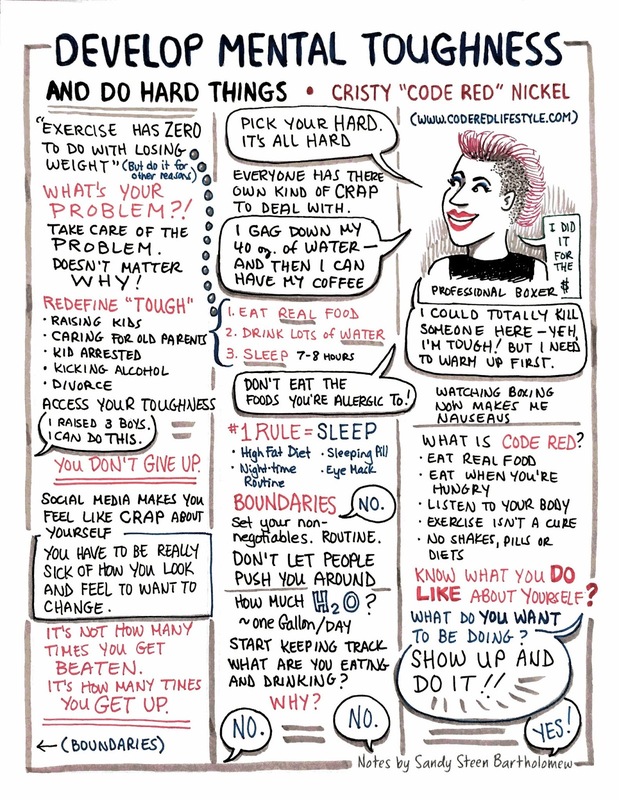 and I'm sure ALL the life coaches and professionals in their high heels and shirts with buttons (I can't handle either- the clothes, I mean, not life coaches!) 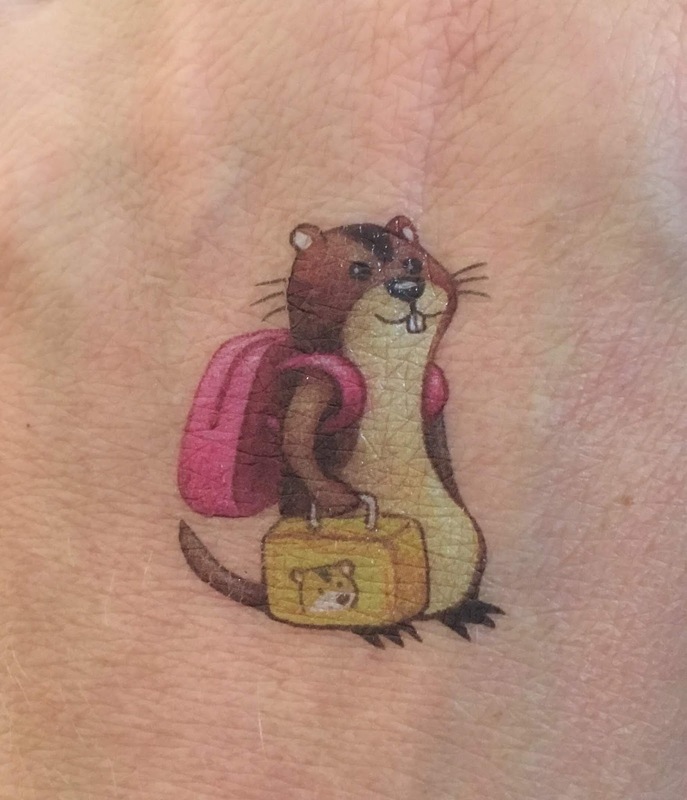 - anyway - they'll all be wishing that THEIR hands were covered with these adorable tattoos instead of their glamorous manicures. Hmmm... I wonder if these would stick to fingernails... how cute would that be?! Panda and Bear and Penguin... like finger puppets!